Top row left: Württemberg military around 1730. Uniforms of Grenadier, Knight-Captain and General. 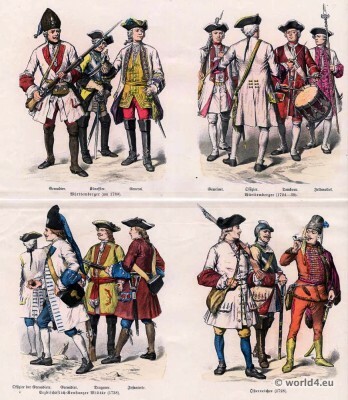 Right: Württemberg military from 1724 to 1738. Uniforms of Common soldier, officer, drummer and sergeant. Bottom row left: Constance archiepiscopal military in 1738. Officer of the grenadiers, grenadiers, dragoons. Right: Austrian military uniforms of the year 1728. This entry was posted in 1724, 1730, 1738, 18th Century, Austria, Germany, Military and tagged Austrian military uniforms, German Military Costume, Münchener Bilderbogen, Uniforms on 1/23/14 by world4. 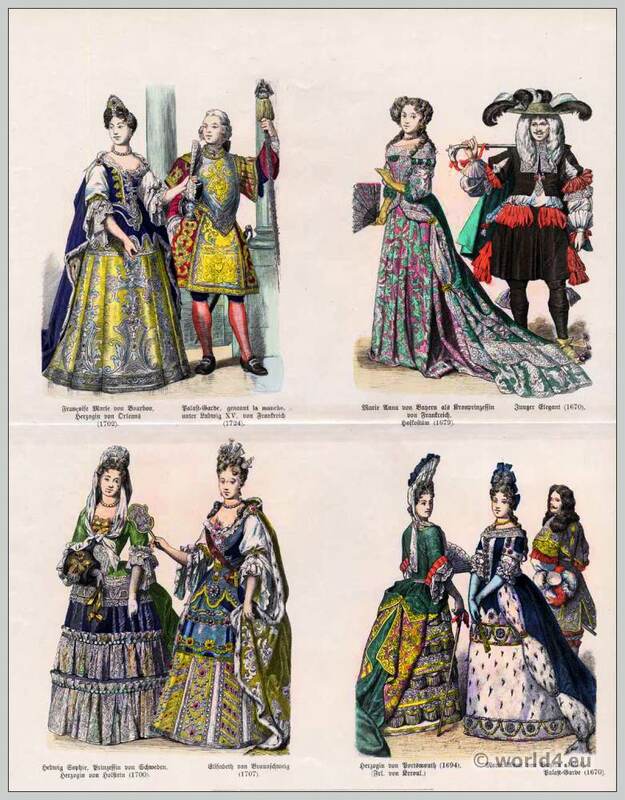 Top row left: court dress of Françoise Marie de Bourbon, Duchess of Orleans, 1702. Palace Guard, called la manche, under Louis XV. of France, 1724. Right: Marie Anna of Bavaria as Crown Princess of France. Court costume 1679. Young elegant man in 1670. Bottom row left: Hedwig Sophie, Princess of Sweden, Duchess of Holstein in 1700. Elisabeth of Brunswick 1707. Right: Duchess of Portsmouth 1694. (Miss of Keroul). 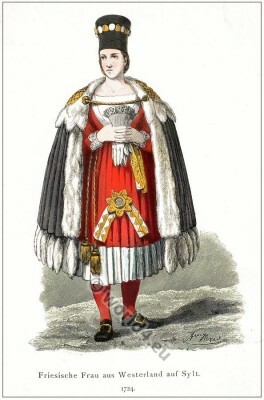 Maria Anna of Bavaria 1694. French palace guard in 1670. This entry was posted in 1670, 1690, 1724, 17th Century, 18th Century, Ancien Régime, Baroque, Court dress, France, Nobility, Rococo, Sweden and tagged Baroque fashion, Münchener Bilderbogen, Rococo fashion on 1/16/14 by world4. 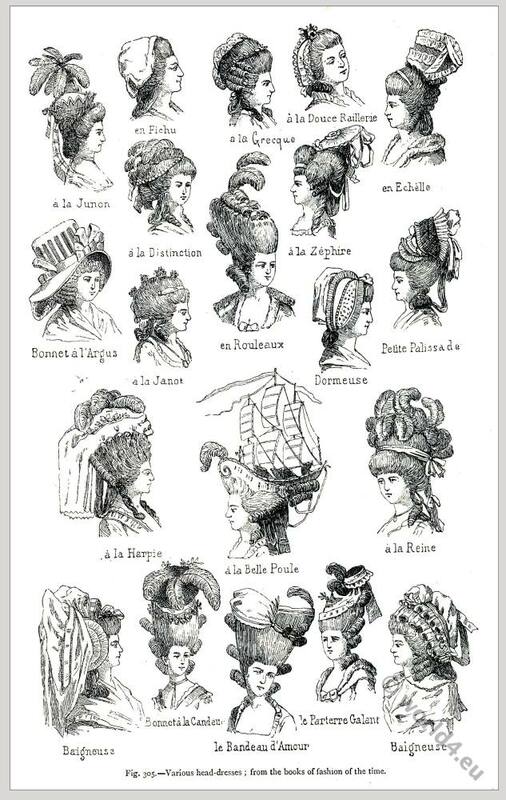 Hairstyles France 18th century. Various head-dresses. Hairstyles and headdresses in the 1720s through 1740s. 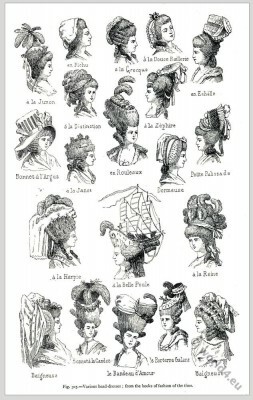 Hairstyles France 18th century. 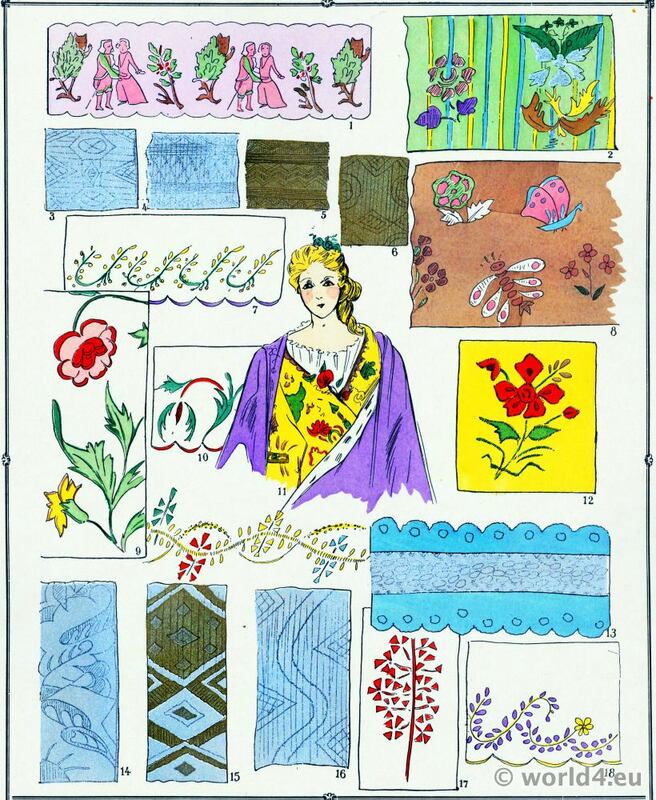 Various head-dresses from the books of fashion of the time. À la Junon, en Fichu, à la Greque, à la Douce Raillerie, En Echèlle. à la Dictinction, à la Zephire, Bonnet à l’Argus, à la Janot, en Rouleaux, Dormeuse, Petite Plissade, à la Harpie, à la Belle Poule, à la Reine, Baigneuse, Bonnet à la Candeur, le Bandeau d’Amour, le Parterre Galant, Baigneuse. 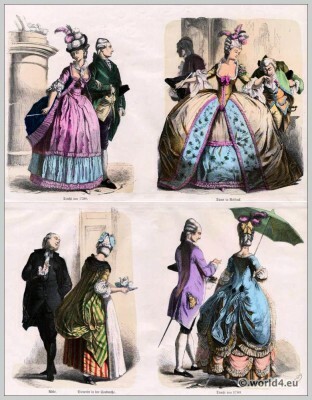 By lithographer Firmin Didot in Paris. This entry was posted in 1724, 1730, 18th Century, Ancien Régime, France, Hairstyle, Headdresses, Rococo and tagged Firmin Didot, Rococo fashion on 12/9/13 by world4. 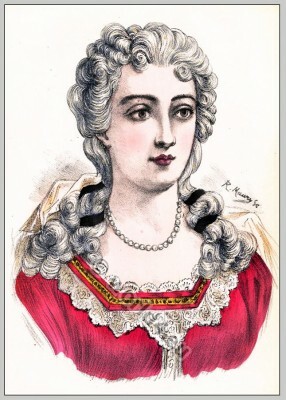 Adrienne Lecouvreur. 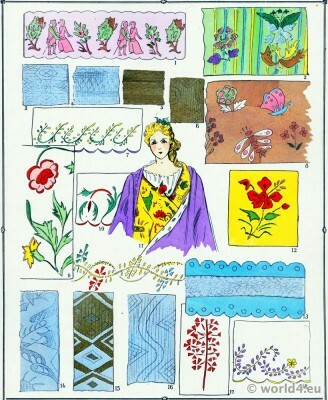 Coiffure Louis XV. Adrienne Lecouvreur was a famous French actress (1692-1730). History of hairdresses. „Album de coiffures histories“ by E. Nissy. Published 1890 by Albert Brunet. France 18th century, Rococo period. This entry was posted in 1724, 18th Century, Ancien Régime, France, Hairstyle, Headdresses and tagged Rococo fashion on 6/11/13 by world4. Frisian islands citizen in 1724. Frisian islands citizen from Westerland, Sylt 1724. 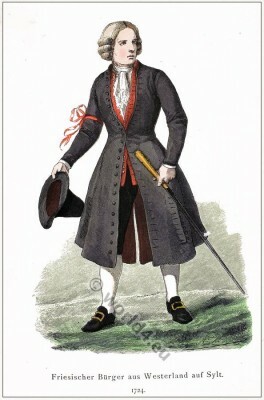 Traditional German men costume, 18th century, rococo period. This entry was posted in 1724, 18th Century, Germany, Hairstyle, Headdresses, Traditional and tagged Allonge wig, Lipperheide, Rococo fashion on 6/3/13 by world4. Woman from Westerland, Sylt in 1724. Woman in traditional costume of the Frisian island of Sylt. 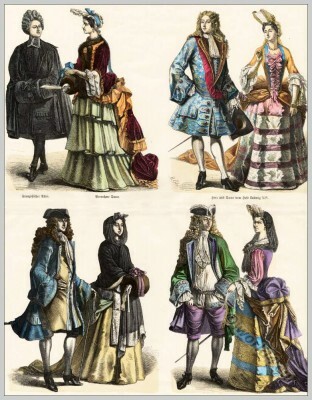 German traditional folk clothing in 1724, 18th century. This entry was posted in 1724, 18th Century, Germany, Headdresses, Traditional and tagged German national costumes, Lipperheide on 6/3/13 by world4.